He has a ruchaka mahapurusha yoga from Chandra Lagna that is quite remarkable to those who have studied yogas. First note that Mars is exalted forming an exceptional Chandra-Mangala Yoga in the 9th. Next note that all remaining benefic planets cause Dhuradhara yoga. This Duradhara yoga is created by Venus and Mercury in the 8th causing anapha yogas. And Jupiter in the 10th causing sunapha yoga. So there you have it, Such a Ruchaka Mahapurusha Yoga is ver very rare. ruchaka yoga: Ruchaka yoga is the mahapurusha yoga caused by Mars as described in Phala Dipika (6.1). Ruchaka implies brightness, splendor or even “taste.” Because Mars is a planet ruling bravery, power, great strength and initiative, this is an astrological mark for leadership, passion, high intelligence, boldness and monumental efforts. Such “Martian” natives are often leaders, students of martial arts, victorious over enemies and powerful. The daring, power and glory endowed through ruchaka yoga sometimes instills arrogance unto the native as well, as seen in the intensity of the native’s chiseled features. A word to the wise: for those who are born under this yoga introspection is called for. You may be insensitive to the feelings of others or consider others’ ideas as unimportant. Mars is known as a militaristic planet, and as a result many leaders in the armed forces or law enforcement are born under ruchaka mahapurusha yoga. mahapurusha yoga: There are five mahapurusha yogas signifying different types of “great personalities.” These five are formed when any planet that rules two signs each is in an angular or kendra houses and is in his own sign or exaltation. Thus when any of the five planets—Mars, Mercury, Jupiter, Venus and Saturn—are swa-rashi or uccha in houses 1, 4, 7, or 10 mahapurusha yoga is generated. Generally, strong mahapurusha yoga in a horoscope will endow a native with fame, wealth, popularity and increased stature. However, the exact of strength of mahapurusha yoga will vary and each one must be considered with a skilled astrologer on a one to one basis. According to Phala Dipika (6.1) the five mahapurusha yogas are ruchaka yoga (Mars), bhadra yoga (Mercury), hamsa yoga (Jupiter), Malavya Yoga (Venus) and shasha yoga (Saturn). Maauma O’halloran Just fount a book of his here in the bookshelf . . .
Ignacio Conde Gutierrez Excellent horoscope and perhaps you have not seen his dharma-karma dipati yoga seen from his navamsa Moon. This in my opinion orchestrated his rasi. Patita Pavana Das Notice the two benefics in the 8th house. His departure was via mystic powers and he announced his departure a couple of days in advance at class as seen on the Suhotra Maharaja Archives. If you cant find it ask webmaster Vidyagati. Patita Pavana Das Suhotra needed to leave on his own power of meditation on the holy names. Therefore, he rid himself of worshipers who respect only the dress. He changed his dress but increased his sadhana. Around some 150 left him (guess) and today only a handful are loyalists. But On his site he describes how he was visited by Vishnujana in his dream and invited to join our departed Gandharva godbrother.Vishnujana; “It’s very beautiful here. Please join me.” (something like that). Abhaya Mudra Suhotra Maharaja’s chart shows a person who was very happy, especially when it comes to digging the secrets of the universe. This is seen by his harsha yoga formed by Venus in the 8th house. Venus is also the lord of his rising sign. Exalted Mars in the 9th shows that he was font of unusual deities and in fact he collected such forms like Lakshmi-Sheshashai and Shri Sadbudja. If those deities were nowhere to be found he ordered his diciples to make them. Bur since Mars is also lord of the 12th house sometimes his deities did not look very pretty and he certainly collected some red Shaligram shilas (Mars) and worshiped them, which was done at the last years of his life. He was aware that they may bring death but he was not afraid as Mars is together with the Moon, lord of the house of courage. Mars lord the 12th house and exalted in the 9th also shows that he was a great traveler and liked to go to places that others would be sacred to go to. He was font of elaborate worship and mantra chanting. This is seen by the mystical conjunction of Saturn and Ketu in the 5th house of mantras and worship. This combination is considered quite mystical, especially, that in this case Mercury, the dispositor is in the 8th house with Venus. He often did 24 hour kirtans. Mercury is also the lord of the 2nd house and he was never worried about money. Jupiter is in the house of Saturn Aquarius which shows that his occupation was indeed brahminical and he enjoyed teaching the exoteric knowledge that he found in his mystical exploration about Shri Krishna to his students. Rahu in the sign of Pisces shows that he had some strange taste regarding friendship but nonetheless he choose his friends amongst the sadhus. His atmakaraka is Rahu and in this situation a person may feel cheated in some way, in this case especially by friends that he considered also his disciples. Nonetheless he had a hunger for devotional association. His Sun in the 7th house shows that his association was always spiritual as the dispositior of Sun’s position is the exalted Mars. He felt at home wherever he could find this association (Sun is the lord of the house of home). The combination of Venus and Mercury in the 8th house shows that he must have hidden some of his diseases. In the last part of Jupiter period this combination led to breaking of his leg which made him walk with a cane. He left his body at the beginning of Saturn period. The dispositior of Saturn is Mercury, also lord of the 2nd house of death in the 8th house of transformation. It was meant to be but his departure was nonetheless mystical. As soon as he entered Saturn he always spoke about death. Ignacio Conde Gutierrez Harish Johari said that Tantra Yoga is formed by the mutual aspects between Venus and Jupiter with Rahu or Ketu. 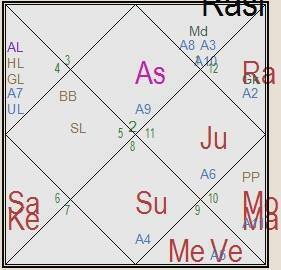 Suhotra do not have these combinations but his Jupiter is in the constellation of Rahu and Venus in Ketu’s explaining thus his mystical abilities and knowledge of Vaisnava tantras. David Norman Willmott I lived quite closely with Maharaja at the school for two years before his passing, and was privy to much of what he was working on. Myself and another teacher, Vagisha Prabhu, were the first to discover his body in his bhajan kutir. Because Maharaja was famously reclusive and absorbed in writing at that time, we actually didn’t realize he had left until a couple of days later!! Then the police had to come and figure out how to process this American’s death. They may even have done an autopsy to determine cause. So that took a while. I understood he was cremated because his body had already begun significant decomposition. I still remember watching his body disintegrate in the flames. It leaves quite an impression. Patita Pavana Das Prabhu David Norman Willmott what is your initiation name? Did Suhotra Maharaja initiate you? David Norman Willmott No Patita Pavana Prabhu. I am yet to receive formal diksa. Suhotra Maharaja was like a siksa-guru to me; and anyway he was restricted from giving diksa at that time (2005-2007). I was hearing him almost everyday when he began the Bhagavatam study course at the gurukul. I’m still living in Mayapur (mostly) and am friends with Pandava, Tulsi, Madhva, Jagannatha Misra … You know them I’m sure; the Bulgarian contingent smile emoticon … I still have Maharaja’s working projects and resources from that time. Ignacio Conde Gutierrez Patita Pavana Prabhu, I am now at 5 days to end my Saturn main period and after 19 years I am already missing Mr Sani as I have learned a lot from hi being Saniacharya. I have been limited in my recovery for almost 5 years in April but at the same time i have been forced to focus on the secrets of astrology. After almost 3 years of reading Prabhupada’s books for one hour a day (from beginning to end and taking notes) I am now reading the 8 Canto chapter 10. Astrology wise, one reads from different angles according to the three stages in life; from the bodily platform between zero to 32, from the mental between 32 and 63 and from the consciousness level after 63. This last phase was recorded on the biggest number ever found by archaeologist on the ‘Niniveh Number’, which was found on a clay tablet and when divided by 360 as the Surya Sidhanta advises, one gets 63 years of Brahma. In other words, the Niniveh number records the number of days in 63 years of Brahma suggesting that once Lord Brahma is 63 years old him and his universe will enter the last phase in life. I started to read Prabhupada’s books soon after my 63 birthday. On the other hand, for the past 5 years I have been following the life of 5 of us in their last years of the Saturn dasa and two have died since then and you almost popped out. The other one is a psychologist and he is now seen a big transformation in his life now one month in his Mercury period. I am just chilling out waiting for the start of my Mercury dasa in which I am planning a series of astro presentations in Youtube. As you have said, “the Moon is the mind, and there are 108 different types of mental outlook or psychological make-up as seen by the navamshas and the nakshatra padas.”. This line is the basic to understand life in the material world. The self is perfect when in Krishna Consciousness, but when interacting with the material energy with the subtle body, the mind, becomes bewildered by the senses working in a gross body. Although the Moon shows a different mentality according to the natal sign in the rasi or horoscope, its compatibility with other signs is at the physical level. This is dealt with the Rasyadipathi or Graha Maitram Kuta, which gives from zero to 5 points in compatibility, but Raman gives an exception when there is not compatibility, “Even when there is no friendship between the janma rasi lords of the bridegroom and bride, Rasi kuta may be said to exists if friendship prevails between the planets owning the navamsas occupied by the Moon.” p75 “Muhurtha”. This is a very simple rule but deep in meaning suggesting that the natal Moon shows the physical body and the navamsa Moon sign shows the subtle body.In other words for example, the external mentality of Suhotra Maharaj was seen as Makara and his subtle mentality was also Makara by having the Moon vargottama but his Moon askavedamsa was in Aries, a fire sign. Modern psychologists are approaching fast what the Vedas say that the subtle body is like the back seat driver that tells the physical, (the senses), on what to focus. This they reported in 2012 after seen the results in two laboratories. The Moon is the sukshuma deha, the subtle body, that takes the soul into other phases of its existence. Krishna is time, and the Moon is the mind. At birth the natal Moon is fixed like in a photo but with its progression across the constellations and its padas, the navamsas, creates the illusion of time. Basically, each navamsa has a good or a bad position, an influential star or planet/s and represents one of the 12 houses read from a horoscope. In other words, the progression of the natal Moon is what we appreciate as time developing events, happiness and sorrow according to the planets, stars or navamsas encountered in the zodiac. In this way we read that in the last quarter of Suhotra Maharaj’s Jupiter dasa, the last pada of the Jupiter constellation,he was in the Cancer navamsa in which he has Rahu and is the 6th navamsa house. He departed in his Leo navamsa where he has Mercury. Sridhar Maharaj as you know was an astrologer,like was his Guru Maharaj,and he said that the subtle body is closer to the real thing than the gross body, this suggesting that the navamsa is more relevant than the rasi or horoscope but still not quite the self or the ahamkara, the deluded self. Of the sodasavarga system left by Parasara only the rasi, the navamsa and the askavedamsa fit together as one navamsa is 1/9 of a sign and one askavedamsa is 1/45 of a sign and 1/5 of a navamsa. In other words, from the rasi we see the implications of the physical body to the material energy with its bhavas, like mother seen from the 4th house, father from the 9th, spouse or sangha from the 7th, children from the 5th, open enemies and obstacles from the 6th, hidden enemies from the 12th, etc. From the navamsa chart we see the implications of the subtle body and from the askavedamsa chart in theory we see the ahamkara, the bewildered self in contact with this mortal level. On the other hand, you mention that Suhotra Maharaj wrote around 300 letters to your wife. From his position he could see the essence in the nakksatras. The 27 naksatras are divided into three groups with nine tarabalas each or 36 navamsas. The janma naksatra or the birth constellation, determines the current life or some 120 years, the following set of nine naksatras show the future life, the next step of the soul, and the previous set of nine naksatras show the purva or the or the previous life. I am elaborating on this according to my research and observations. Planets in those three sets of constellations and the stars and good or bad navamsas, have an influence on our present life. After all, we all have to act according to our previous karma. Atheists or ignorant people claim that we only live once as if to say that only the current nine constellations work in a linear finite implication, forgetting however the whole, the cycle of 360 degrees that considers the past, the present and the future. When we are in anxiety we see dualities like good and bad and see planets accordingly but when in harmony we see the whole helping us. Saniacharya for me has been though but wonderful teaching me austerities, tolerance and other useful tips. Nevertheless, the chanting of Hare Krishna is the best guidance. Patita Pavana Das Prabhu, congratulations for escaping Shani dasha. This is wonderful, so many lessons and transformations during that slow and often dreary period. Budha dasha is very nice in the later years,, and since you have the Bhagavatam and Shrila Prabhupada teachings and the guidance of your Guru Maharaja as your Krishna conscious foundation, then your life has become perfect. That is genuine astrology: everything in Krishna service.